These shoes are made from both turn shoe and hob nail contruction, see the difference here between turnshoes and regular shoes. See pictures of our shoe craftmanship or check our shoe quality on our videos . Our Rope Sandals are Made in the USA. Our leather shoes are made in Pakistan by a "Company that is a member of ILO and helping them to eliminate the Child labor from this industry. This company is taking special care of worker's welfare. To look after their health and environmental necessities giving its utmost contribution in this regard." Below is our main line of shoes that we are trying to always have in stock in all sizes and colors (as listed). We will let you know right away (within days) if we do not have your size or color ready to ship. Shoes ship within days of ordering, usually the next day. These sandals are handcrafted from soft polypropylene rope. The soles are double layer and the shoes are very durable. They have an adjustable backstrap which allows for a better fit. These shoes are machine washable and can go in the dryer. Made in the USA (West Virginia). Early period shoes tended to be simple in construction, usually made from turn shoe construction. This style would have been worn anywhere from Biblical times but even up to the Viking and Medieval era. 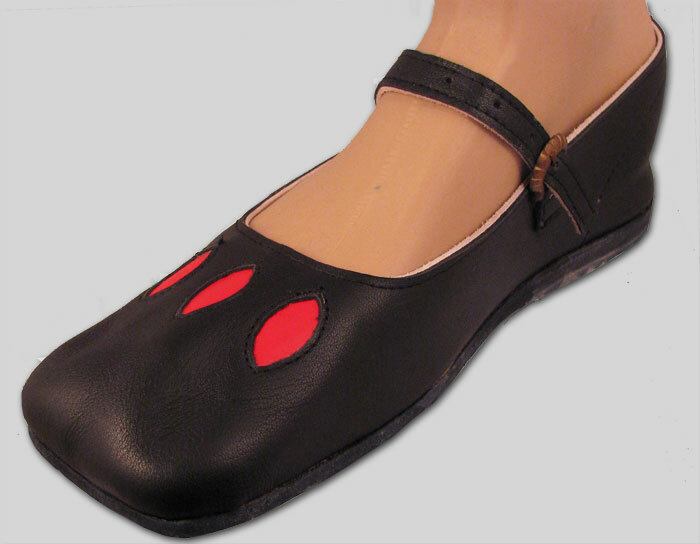 These shoes also work with later period styles and are perfect camp shoes or slippers. Natural/tan Early Period Turn Shoes - $55. This is a Roman period style shoe, also called Caligae. 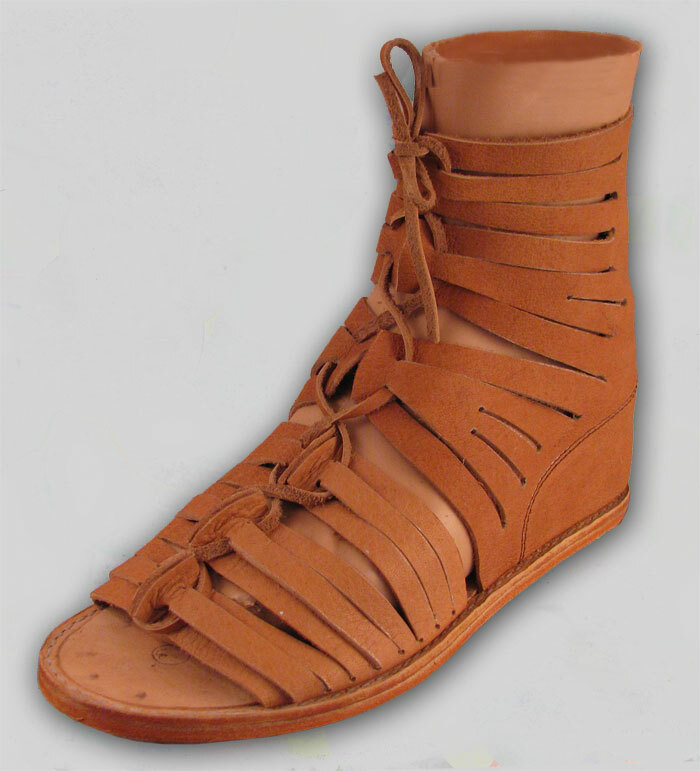 These were worn by Roman legionary soldiers and auxiliaries throughout the history of the Roman Republic and Empire. They were worn by all ranks up to and including centurions. They make excellent Gladiator shoes. These shoes can be documented to the Viking era, and would have also been worn by many of the contemporary peoples such as the Saxons, Normans, Jutes, Visigoths. Some of these styles were worn into the latter middle ages. These shoes can be documented to 11th century, and would have been worn by many of the contemporary peoples such as the Vikings, Saxons, Normans, Jutes, Visigoths. Some of these styles were worn into the latter middle ages. Click on picture for more details and documentation. Beautiful Medieval style boot with hand stitching, lace closure and hob nail soles. This is a period style that was worn in the 14th century as an ankle boot. Julliet style medieval buckle shoe. This style features a high vamp, regular heel collar and a split instep strap with a buckle. This shoe has hob nails and a hard sole. Authentic style Landsknechte / Tudor Shoes. Perfect for Renaissance Faire. Very well made. More sizes in stock soon. This Mary Rose shoe is documented to the shipwreck of the Mary Rose. She was the flagship of King Henry the VIII but she was sunk by the French in the Solent in 1549. She was raised in 1982 (and you can see her at the www.maryrose.org Mary Rose Museum in Portsmouth, England). This shoe was worn by a typical sailor and is one of the few examples of preserved shoes that is not of an elite class. The slits were to let the water out, and they are made of a sturdy construction with a thick sole cobbled with nails to ensure long lasting quality. These are real pirate shoes! This is a period style shoe. dating most likely 1650's-1690's. This shoe is can be worn at Jacobean events, Renaissance Faires, Pirate Festivals, for steampunk, LARPing, and many other cosplay (costume play). This shoe has hob nails and a hard sole. It is very comfortable, even without an insert that can be easily added. They are made in the "straight last" style, having no difference between the left or right foot. These are the same shoe as the latchet shoes but have a high tongue and are for a later period. Worn in Colonial times.